In the linen closet? That's right, more storage in a closet specifically made for storage. Who knew! But if you're like me, living in a house with very few actual closets, you know you have to make the most of what you have. A shoe storage bag placed on the inside of the closet door. It's as simple as that. Actually, I came across this idea in a This Old House article and as soon as I read it I thought to myself - why didn't I think of that? Genius. 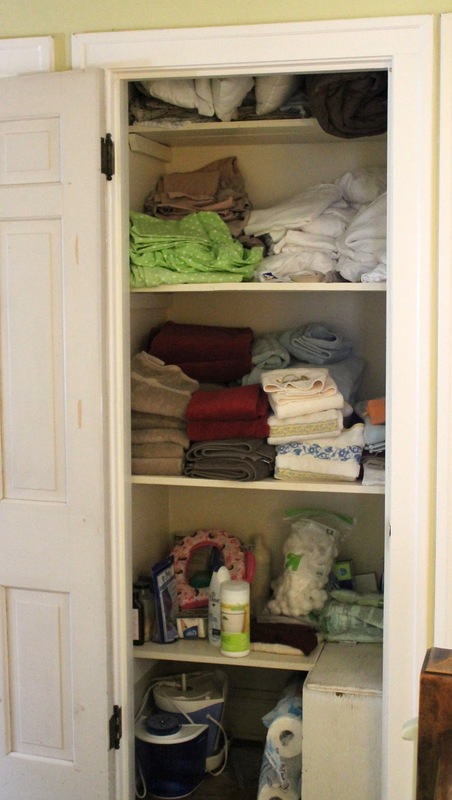 I've filled mine with some of my must haves like Shaklee Germ Off Wipes, some of the bulkier toiletries, as well as some rarely used items like seasonal towels. 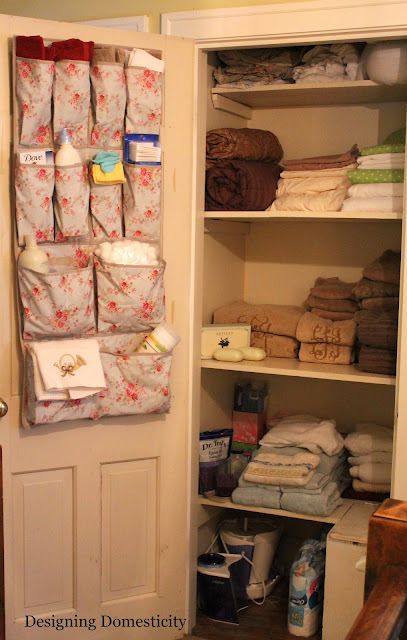 I'm loving this solution for a variety of reasons - the top two being: it's storing all those little items like wash cloths that take up so much space and it's keeping my toiletries organized so I know when I need to replace something. Here's how we were looking before...everything fit, but there wasn't much room to grow. Ah, that makes me happy. Even if these nicely folded towels and sheets only last through one more wash. At least there will be more room for the future messily folded towels and sheets! Ok, well, I think I have exhausted this topic for now. But worry not, I'll be back with more unexpected storage in the future. It's back to more work in the basement playroom for us this weekend - what are you up to?